The State Government has published a series of damning report cards on South Australia’s climate outlook, with key climate change indicators including sea level, rainfall and temperature showing a worsening trend line. The 41 report cards, released last month in the Government’s Tracking changes in South Australia’s environment report, show South Australia is set to become increasingly hotter and drier, with average annual rainfall projected to decrease by between 5 and 15 per cent by 2050. The state’s daily maximum temperature is set to increase by between 1.0 and 1.2 degrees Celsius by 2050 while sea levels are projected to rise by 22-25cm. 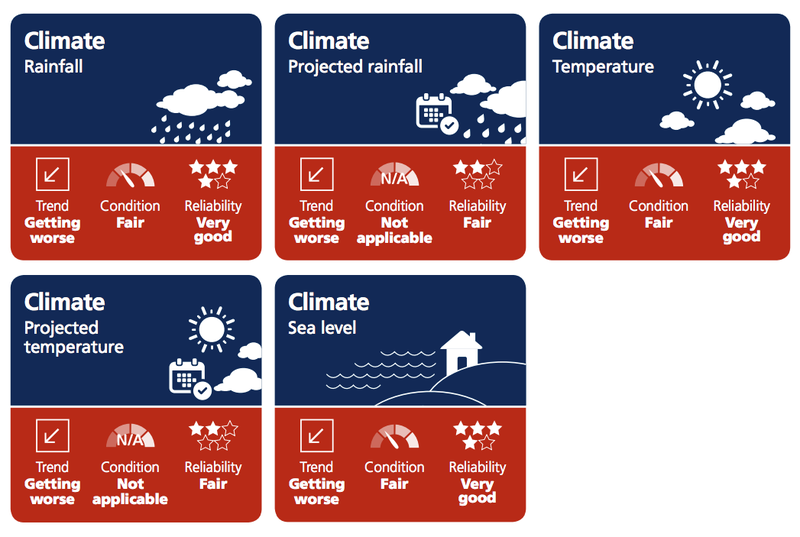 Environment Minister David Speirs described the report cards as providing the “most complete picture we’ve ever had on the successes and challenges in managing our environment” – noting the worsening climate trends as part of those challenges. Already South Australia is experiencing a hotter and drier climate than in the recent past. According to the report cards, the annual frequency of days over 40C has more than doubled from 1977 to 2007. The report cards also note persistent drying trends in the state’s southern agricultural areas, which the report warns may reduce water security and agricultural yields, impact ecosystems and increase fire risk. Climate report cards from the State Government’s Tracking changes in South Australia’s environment report show worsening trends. Earlier this week the United Nations released its Intergovernmental Panel on Climate Change (IPCC) report, which calls on governments to hold warming to 1.5C rather than 2C. The Australian Government’s current target of 1.5C is in accordance with the climate change targets outlined by the Paris Agreement. But the IPCC report authors warned the world has only 12 years to keep warming to a maximum of 1.5C before “catastrophic environmental breakdown” could occur. Greens MLC Mark Parnell told InDaily this morning he is planning to move a motion when Parliament resumes next week calling on the Government to follow the recommendations in the IPCC report. “The recent release of the latest IPCC report just adds to the urgency of the (climate) situation,” Parnell said. Conservation SA chief executive Craig Wilkins said South Australia is heading towards a “train wreck” climate outlook if current climate trends were left unabated. He cited the potential impacts on the agriculture industry, native vegetation and biodiversity and landscape as reasons to take seriously the State Government’s report card outlooks on temperature and rainfall. “It is essential that we go in harder with how we address climate change and take note of what the changes will look like in our state,” he said. Wilkins said the State Government had been doing a good job in implementing and supporting “landscape scale work” across the state – a process that he said connects public and private landholders to work collaboratively for a “whole-scale approach” to addressing challenges facing native flora and fauna. The Government’s report cards show there has been a statewide decline in biodiversity, with native flora and fauna populations in decline as invasive species encroach on habitat. The report cards cite a changing climate as adding to the pressures impacting native species’ survival. Minister Speirs highlighted improvements in soil erosion protection, an increase in the percentage of mangrove vegetation cover and general improvement of water quality in the River Murray as positives from the report cards. In 2016-17 water flow into the Murray from across the border was among the highest in 40 years, helping to reduce salinity. Noting the changes in temperature and rainfall, Speirs said the State Budget, handed down last month, “put a focus on continuing our transition toward more renewable energy as well as investing in practical measures to protect our environment against the changing climate. “This included our $184 million energy solution, including $100 million home battery storage subsidy scheme, $10 million to establish Glenthorne National Park in Adelaide’s southern suburbs, $5.2 million for coastal protection and $2 million for Greener Neighbourhoods,” he said. The State Government’s Environment Protection Agency will publish a new State of the Environment Report this year.